This card is entered into the Crazy Crafters Project Highlights. To vote for it and to see all the other great projects click on the link. On Sunday 8 May, I participated in the Crazy Crafters Blog Hop with Dena Rekow as our guest stamper where we CASE'd one of Dena's projects. I decided to do a split card and had so much fun with it that I ended up making several cards and then having to decide which one to include in the Blog Hop! 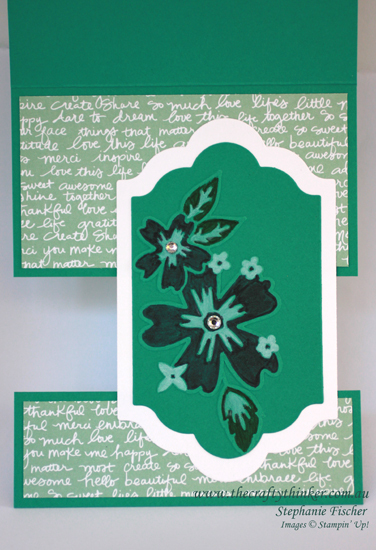 This was one of the cards that I didn't include in that Blog Hop but I like it enough to share it with you anyway. So "thank you" once again to Dena Rekow for the inspiration and tutorial on split cards. I used the new In Colour Emerald Envy for this card and layered it with some Mint Macaron DSP from the 2015-2017 In Colour DSP Stack. I used Lots of Labels framelits to cut a layer of Whisper White and a smaller layer of Emerald Envy. Then I embossed the green layer with one of the new embossing folders from the Floral Affection Textured Impressions Embossing Folder (there are two small folders in the set that will be available on 1 June). Such an impressive design - so easy to do! I used a Basic Gray Stampin' Write Marker and some Whisper White Craft ink to colour the embossed section before adhering it to the white layer and using this panel to attach the two parts of the split card. Last, but not least, I added some Rhinestone Jewels to the flower centres.